Pensions have been on their way out for a long time. They’re expensive for employers, and they require lots of rule-following and reporting. But the sponsors of pension funds run by Catholic hospitals have taken advantage of an IRS rule, which, in effect, gives zero protection to retirees if the pension goes bust. The U.S. Supreme Court could decide as early as Monday whether it will consider such pension cases, impacting thousands of New Jerseyans who worked for St. Peter’s University Hospital in New Brunswick and tens of thousands of Catholic hospital employees nationwide. The decision could also affect another Catholic hospital pension that’s months away from going belly up, Bamboozled has learned. The pension promised to employees of the now defunct St. James Hospital of Newark is almost broke, leaving 76 employees without the retirement money they were counting on. The news came in a letter from Transamerica Retirement Solutions, the company that invests the fund and sends the monthly payouts to recipients. Lubinski’s husband, Henry Lubinski, said the letter was a shock. We followed a long and twisty trail to find the responsible party. Transamerica doesn’t sponsor the fund but instead manages investments and makes payouts. It said in a written statement it’s been trying to get direction from the sponsor of the plan, Cathedral Healthcare System, which is affiliated with the Archdiocese of Newark. Cathedral was “unresponsive” to inquiries, Transamerica said. 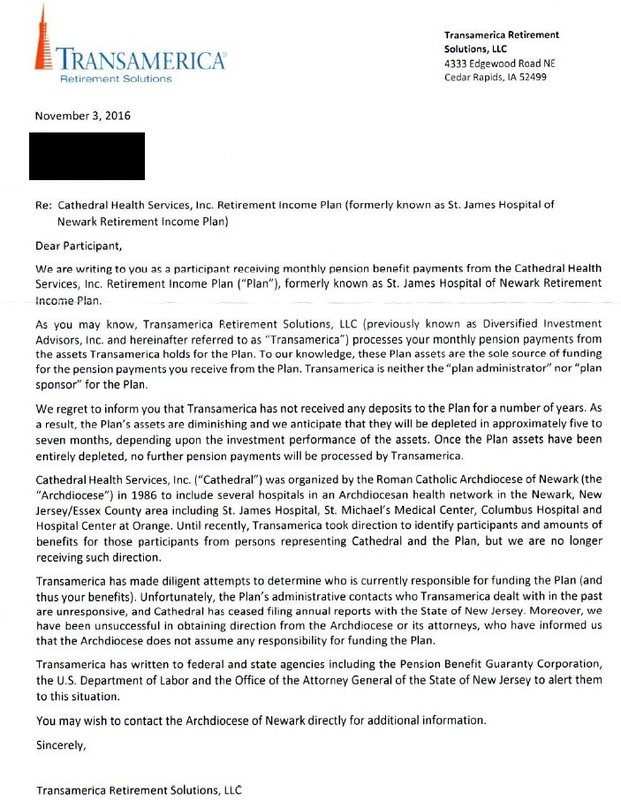 In its letter to pensioners, Transamerica suggested they contact the archdiocese for more information. The archdiocese told Bamboozled it’s not responsible. That was confirmed by Transamerica. St. James’ owner, Cathedral Health, was purchased by Catholic Health East (CHE) in 2008. As part of the deal, St. James and another Catholic hospital — Columbus Hospital — would essentially shut down and some services would be absorbed by St. Michael’s, which was also part of the deal. At the time, The Star-Ledger reported the sale hinged on a low-interest bond deal for CHE and state approval for the shutdown of the two hospitals. It was approved. An article in Catholic Advocate that month reported the same. It seems that CHE still had responsibility for the pension, but it wouldn’t be that simple. CHE merged with Trinity Health in 2013, but a Trinity spokeswoman said the pension assets and liabilities were not part of the 2008 transaction. What about the press release? The spokeswoman said she didn’t know why “seemingly with incorrect or misleading information” was released. That wasn’t our last corporate stop. Earlier this year, Prime Healthcare bought St. Michael’s from Trinity. Prime said it didn’t take on the liability, either. Even with corporate responsibility uncertain, we figured the pension would have insurance from the Pension Benefit Guaranty Corporation, or PBGC. You see, traditional pension plans have to follow a lot of rules to provide safeguards for pension recipients under the federal Employee Retirement Income Security Act (ERISA). Those include minimum funding requirements for the plan and PBGC insurance. If a plan insured by PBGC fails, PBGC will make pensioners mostly whole. There’s a monthly maximum payment limit, but generally 85 to 90 percent of the benefit would be covered. That’s when the bad news for St. James pensioners was confirmed: PBGC said the pension was considered a “church” plan and was not required to carry insurance. An IRS rule gives an out to pension plans with religious affiliations, saying ERISA rules don’t apply. That means they could essentially run pensions without having to follow the same rules as non-religious plans, and they didn’t have to buy insurance to protect pensioners. This provided a windfall for Catholic hospitals. They no longer had to pay the insurance, but they also saved on all the paperwork and filings requirements of plans under ERISA. What’s more, they could substantially underfund the pension plans with no consequences. The consequences would instead be faced by workers who had counted on their pension plans to fund their retirement. 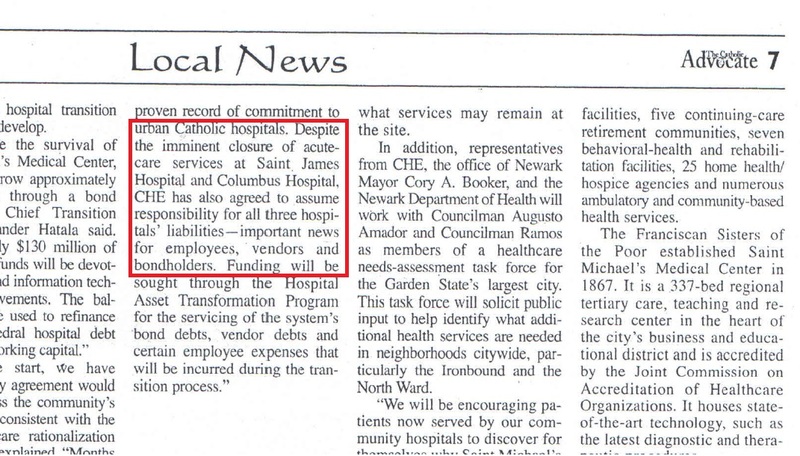 In 1990, back when St. James was owned by Cathedral Health, PBGC said, it requested to change its pension plan to a “church” plan. Cathedral said it made a mistake when the pension was established and it always should have been a “church” plan. PBGC said most of Cathedral’s premium payments were refunded. So now, participants in this plans have no recourse outside of whatever remedies are provided by state law, PBGC said. That means the only option for pensioners would be to sue. Pensioners have sued, and they’ve made progress. Several recent court cases argued that because the Catholic church doesn’t fund Catholic hospitals, the hospitals’ pensions shouldn’t have the “church” exemption. Right here in New Jersey, the Metuchen Diocese-sponsored St. Peter’s University Hospital pension plan was covered by ERISA until 2008, when its request to be considered a “church” plan was granted. That led to one of the lawsuits that may make it to the Supreme Court. Plan participant attorneys from Cohen Milstein Sellers & Toll argued the plan was established by the hospital and not by the Catholic church, that St. Peter’s followed ERISA laws for 32 years, paid PBGC premiums until 2010 and gave employees documents that said the pensions were covered under ERISA and the pensions were guaranteed by PBGC. St. Peter’s said the case should be dismissed because the plan was, in fact, a “church” plan. But the court sided with pensioners, saying to receive “church” plan status, the plan would have to be established by a church, not just be affiliated with one. Then St. Peter’s lost its appeals. With a decision that the plan should not be a “church” plan, a lawsuit alleging St. Peter’s violated ERISA could continue. But with the Supreme Court, St. Peter’s is giving it one more try. The district court granted St. Peter’s request to stay the proceedings until there’s an answer on whether the Supreme Court will consider reviewing the case by granting cert (short for certiorari). If the Supreme Court denies cert, in essence, declining to review case, it would be a dagger in the heart of St. Peter’s efforts and impact similar cases against Catholic hospitals in California and Illinois. And it would set a precedent that could be good news for the St. James pensioners. That decision could come down as early as today, according to persons with direct knowledge of the case. The Lubinskis say they’re going to contact the attorneys from the St. Peter’s case to see if there’s a chance for St. James. “They’re hiding. They’re using a loophole to act in an inappropriate and unethical manner,” he said. In the meantime, if you want to check up on the status of your own pension plan, contact your plan sponsor. And if you don’t get the answers you want to hear, contact PBGC at (800) 400-7242, or search for your plan online. Staff researcher Vinessa Erminio and staff reporters Susan K. Livio and Kathleen O’Brien contributed to this report.